Will a straight neck give you arthritis? It’s possible. We look at the link between loss of cervical curve, the straight neck, and arthritis in the neck. What does it meant to have a straight neck or a loss of cervical curve? The medical terms for a straight neck are kyphosis, lack of cervical curve, or military neck. In extreme cases one or more vertebra can tilt backward, creating a reverse neck curve. 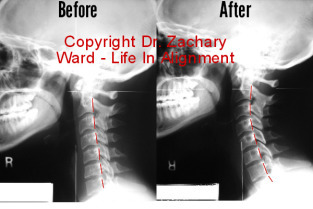 A straight neck is not a good thing and can have a number of consequences for human health. Let’s focus on one reason a straight neck is bad—it can be associated with osteoarthritis in the spine (the breakdown of neck joints). Return of a healthy neck curve after four weeks at Life In Alignment. Why does the neck naturally curve? In a normal healthy state, the human neck has a forward curve, which develops early-on in life. The spine of a baby is shaped like a letter “C.” As the baby begins to hold up his or her head, the weight of the head stimulates the development of neck muscles which put a curve into the neck. Curves are an important part of the anatomy of the spine. They help support the weight of your body. They also cushion the spine and protect the delicate nervous system inside of the spinal column. and disc disease (including bulging and herniated discs) in the neck. Straight neck is often accompanied by a forward head, a problem called forward head syndrome, or forward head posture. According to experts in biomechanics (the study of the movement of the body) a forward head can put as much as ten pounds of extra pressure on the spine for every inch the head moves forward of the shoulder. Forward head posture can place as much as 30 extra pounds of stress on the muscles, blood vessels, lymph tracks, nerves, and joints of the neck and upper shoulders. Why do straight necks inflame neck joints? When you examine the shape of the neck from the side, the reason why a straight neck stresses joints becomes clear. The major anatomy of most of the joints of the neck include the vertebrae, the disc between the vertebra, and the “shingle” shaped joints which line up at the back of the neck, called facet joints. In a normal adult spine, the facet joints of the neck are larger than the joints created by the vertebrae and the intervertebral disc. The facet joints are larger because they are meant to carry most of the load of the head. This is different from other areas of the spine, like the lower back, where the disc and the vertebra are larger because they carry more weight. The discs in the neck begin to carry more weight than they are supposed to. In time this causes the discs to break-down and degenerate, causing arthritis. This is often why disc disease starts at the front of the disc in the neck, and not the back. The facet joints, made to bear a majority of the weight in the neck, carry less of a load. This lighter load creates lax ligaments, allowing more movement of the individual vertebrae. As the downward force of the head moves forward, neck vertebra can even slide backward, creating a retro-flexion, and eventually a reverse cervical curve. The result is more break-down in the joints of the neck, causing more joint inflammation, or arthritis. What options do you have for addressing the cause of your curve breakdown? Unfortunately, there are very few health care practitioners who will take this break-down of your cervical curve serious. Most will only note the damage and tell you there is nothing you can do about it. Your upper cervical chiropractor, however, understands the prime role the health of your neck has for the rest of your spine, and your body. In many cases, natural improvements in the shape of your neck are possible with a gentle course of upper cervical chiropractic care, to help your body carry the weight of your head more efficiently.